A fantastic card trick that involves a bit of audience participation and a bit of sleight of hand for a mind blowing reveal at the end. The magician has a spectator pick a card and then pulls out two cards himself of the same value. He explains that these two cards will do the actual magic and has the spectator put the chosen card in the deck. After cutting the two detective cards into the deck the magician fans the cards to show that the two cards have trapped the chosen card between them. A special way of counting three cards as two sets up the reveal right under the eyes of the spectator. A normal deck of cards is all that is required. Outside of practice there is no special preparation needed. Any two cards of the same value can be used as the “detectives” in the story, but face cards or aces have most visual effect. Part of this trick takes place in the hands of the spectator and the magician should use this time to do the one of the sleights required. Magician shuffles cards as he talks about his special helpers, two cards in the deck that help him perform his magic tricks. They are not magicians but rather detectives, doing all the work needed to find any card chosen by the spectator. 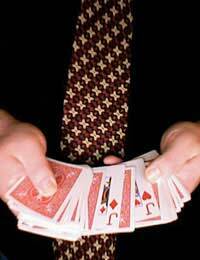 After fanning the cards the magician invites a spectator to choose a card and remove it from the deck. At this point the magician looks through the deck for his two helper cards, say the two red jacks. Pulling the cards out, he sets them face down on a table. If doing close up and no surface is available, he can have another spectator hold them for a moment. The magician cuts the deck and has the spectator place the chosen card on top of the bottom half. Holding a break when replacing the top half, the magician can then cut the cards. This will bring the chosen card to the top of the deck. The magician will then hand out the two cards for inspection. At this moment he should slide the top (chosen) card slightly forward using his thumb, just enough to get tip of the little finger under the card. When the magician takes back the two detectives he places them both face UP on top of the chosen card. He can then slightly pick up the packet of three in his right hand. The left thumb can then grip the top jack as the right hand pulls away both of the bottom cards as one. The magician names the top card, “Here we have the Jack of Hearts,” as he pulls the packet away. He then places the packet on top of the first jack as he names the second card; “and the Jack of Diamonds.” The chosen card is now between the two face-up jacks. At this point the sleight of hand is done. The magician then puts the packet of three cards back on top and simply cuts the deck. After an appropriate amount of story telling, he spreads the cards to show that the jacks have surrounded the chosen card. Practice the false count, when you trap the chosen card, until it is flawlessly smooth.